Azerbaijan is interested in developing cooperation with Pakistan in all areas, particularly in political, economic, cultural and military spheres. 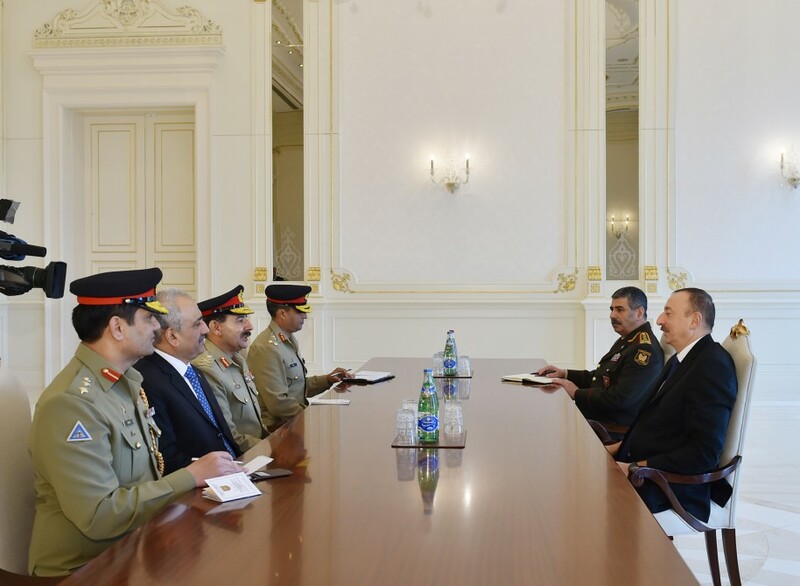 President Ilham Aliyev made the remark in a meeting with Rashad Mahmood, Chairman of Pakistan’s Joint Chiefs of Staff Committee on March 1. Addressing the event, the head of the state hailed the successful development of relations between the two countries. President Aliyev also emphasized the importance of the two countries’ constant support for each other within the international organizations. Discussions on the strengthening of the cooperation will be held during the visit of the delegation led by Mahmood, the president said, expressing his confidence that these talks would be successful in terms of taking additional measures towards the expansion of ties. Mahmood, in turn, emphasized the ancient history of political, cultural and religious ties between the two countries. The Pakistani representative noted that Azerbaijan and Pakistan have always supported each other in most difficult times. “We have always been willing to improve these relations, Azerbaijan is in our heart, and we have always proved it,” Mahmood added. Rashad Mahmood arrived in Azerbaijan’s capital on March 1 with a three-day visit. During the visit, the Pakistani delegation will meet with Azerbaijani officials. Later, the Pakistani delegation was received by Prime Minister Artur Rasizade. Stressing the importance of deepening the cooperation in military field, the parties condemned the aggressive policy of Armenia, which is threat to the stability of the region. Pakistan supported Azerbaijan during and after the Nagorno-Karabakh War and it is the only country that does not recognize Armenia. Relations between the two states were established after Azerbaijan became independent following the collapse of the USSR in 1991. Pakistan was among the first countries to recognize Azerbaijan. The fundamental building block of the bilateral relationship between Azerbaijan and Pakistan is military cooperation. The sides intend to join efforts to gain access to modern technologies, as well as modernize their potential. The two sides also focused on the development of economic relations. Trade and cooperation has steadily grown between the two nations, with several summits being held on how to improve trade between the two nations.